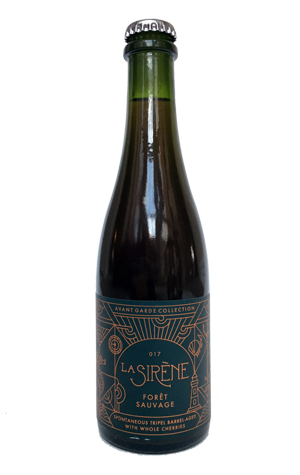 When you're a brewery like La Sirène, it's good to have time on your side. Outside its core range of saisons and farmhouse style ales is an ever-growing and diversifying series of projects incorporating spontaneous fermentation, barrel ageing and much more besides. Some of them were kickstarted several years ago, in the early days after the brewing company built its brewery in Alphington, giving the brewers liquids that have been evolving for years to play with, sometimes blending them, racking them over fruit or releasing as single barrel small batches. One beer that's been taking shape for an age is this Forêt Sauvage. It started out as a 100 percent spontaneously fermented tripel – the wort was left outside the brewery overnight, open to the microflora of Darebin Creek, to kickstart a slow fermentation over a period of many weeks – before finding a home in French oak. There, with King Valley cherries for company, it spent another 18 months. The result of this activity is one of the more potent releases from the brewery, leading off with intense berry and bitter orange fruits and a lively acidity and packing a pretty lip-smacking sour, dry and funky finish. In between, there's the Madeira wine like characters familiar to those who've sampled the straight Wild Tripelle and some softening oak characters too, making for a beer that will appeal to those keen to explore the more out there realms of wild beers.